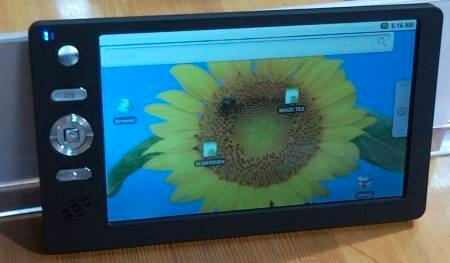 The seriousness on the work of production of the Android tablet at $35 has increased since the HR & D minister in India showed the prototype of the tablet device during an interview, to prove all the rumors as true. As it was said earlier, the device production has started already and it is expected that the device would be ready to be supplied to the universities and available for use from January 10th, 2011. The expectation is strong, giving the fact that they are going to be made by the HCL computers, who has been a trusted brand in India. HCL is known around to manufacture the cheapest laptops in India. As promised earlier, the number of devices that might be coming out together is around 1 million, and the price is still going to be around $35. And initially, only a 7-inch model would come out, and later there might be the 5″ and 9″ devices too coming in. The tablet device would be coming in with Android, and has a touchscreen with the resistive interface, and the on-screen keyboard and the connectivity to the web would be through the Wi-Fi. The tablet also boasts a camera which would help in capturing pics and videos. The tablet also contains a SIM-card slot along with the USB slots, which makes it more advantageous than the Apple iPad too. It may run all the videos and presentations, and would come to the best use for students in the universities. Samsung too recently entered the Tablet world by unveiling their Samsung Tab device which would mimic everything of their own Smartphone Samsung Galaxy S, but the main difference would be the size which is the 7-inch. But the pricing is yet to be confirmed, which is expected to be nothing less than $600, so these new entries into the android world are no where to compete with this $35 android tablet in terms of pricing. The HRD Minister Kapil Sibal also indicated that the price can go to as low as $10 if the companies of the hardware agree to compensate more on it in future. At this low price, no one may believe it as true. But we indians know, that Tata manufactured 1 lakh car, and Ind-govt can also go crazy and make this real. BTW, where to pay $35 in advance for booking it before launch? Hey Arup, I think you must wait for some more time. This tab may be available with 3g and 9″ screen then. Isn’t there anyone to reply to my query?